A Scheme is an authorised document produced by the Commission. A Scheme can amend all or any part of a charity's governing document. Because a Scheme will always bring change for a charity, it is important that the trustees take responsibility for managing the changes in the best interests of the charity. Our role is to ensure that, where needed, the Scheme is validly made in accordance with our statutory powers. answer common questions regarding Schemes and the Scheme making process. This guidance also sets out the legal basis behind our Scheme making powers and the legal requirements we must follow when making a Scheme. the manual - Scheme procedures and practice. This gives details of the Scheme making process and includes model text for emails and notices, etc. the Scheme Drafting Guide. This includes model text to include in a Scheme. B10.6 How should public notice be given? B10.9 How long should the public notice period be? C1 When is a Scheme required to amend a Governing Document? C2 Is public notice required when making a Scheme? F1 What is a Scheme? F2 When might we make a Scheme? F3 Who can apply for a Scheme? F4 How can trustees apply for a Scheme? F5 Can we make a Scheme without an application from the trustees? F6 Do trustees need to publicise a proposal to make a Scheme? F7 Can we make a Scheme for a charity governed by Royal Charter or Act of Parliament? F8 Do we need to carry out trustee checks before we make a Scheme? F9 Can we make a Scheme if the governing document is missing? 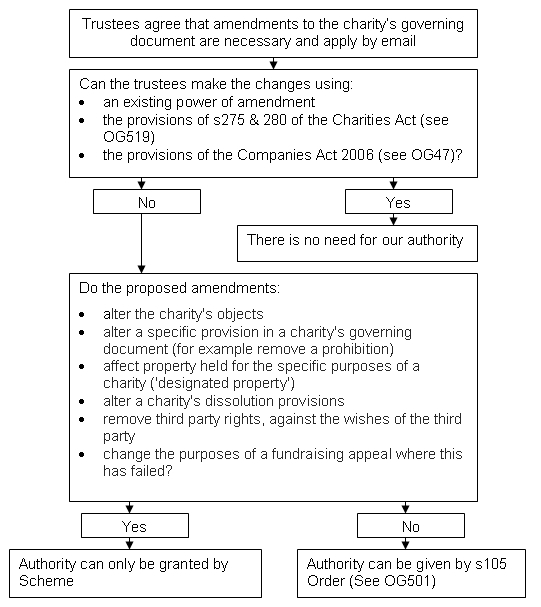 We will only make a Scheme to amend the governing document of a charity where there is no other way to make the required changes - see Changing your charity's governing document (CC36) which describes the other options. The Scheme will be limited to changing those trusts that cannot be changed in any other way – other changes can be made by the trustees. There are generally two types of Scheme that we make using our powers under the Charities Act 2011 - cy-pres Schemes (Schemes that alter the purposes for which charity property is applied) and administrative Schemes. We also have power to make other types of Schemes using powers contained in other legislation - see, for example, OG27 Reverter of Sites Act 1987. There are certain legal tests and other factors that need to be considered when we are deciding whether to make a Scheme. These tests are different, depending on the type of Scheme we are considering making. The consultation should be designed to seek the views of those who would be affected by, or those who would have a particular interest in, the changes proposed. Unless the changes are minor, or the particular circumstances of the case are such that consultation is unnecessary, we will not usually offer to make a Scheme without evidence of an appropriate consultation process. In all but exceptional circumstances, we can only make a Scheme for a charity where the charity's trustees have submitted a formal, valid Scheme application. Generally, we will not accept draft deeds and will not make Schemes to authorise these to be adopted. In exceptional circumstances, we can accept a draft of a Scheme, or a trust deed, that the trustees have produced themselves. However, we will only do this where there are identifiable and cost-effective reasons. We would usually expect the draft to be a direct copy of one of our model Schemes or of a recognised model trust deed. If our Scheme appoints trustees to the charity we must carry out the necessary trustee checks to ensure that the trustees we appoint are not disqualified by the Charities Act from being a trustee. Where the charity works with children or vulnerable adults, we must carry out DBS checks to ensure that the proposed trustees are not disqualified or unsuitable to act as trustees of this type of charity. Where our Scheme simply names serving trustees, the Scheme does not appoint the trustees so we do not need to carry out trustee checks. This is the responsibility of the trustees. We will need to make it clear in the Scheme that we are only naming, and not appointing trustees. We cannot make a Scheme without first notifying any trustee who was not privy or party to the application for the Scheme. We must also notify and/or consult with other interested parties. If the Scheme will remove an individual (including a corporate body) from a charity, we must notify the individual before we make the Scheme unless they have consented to the removal. The Charities Act requires that we give public notice of our intention to make a Scheme. However, the Act also states that we can, for any reason, decide that public notice is not necessary. In practice, we would expect public notice to be given only where the Scheme might be contentious. Where public notice is given, we are required to invite representations to be made about the Scheme. If we receive representations we must consider these and may decide, as a result of the representations, that the draft Scheme should be amended, abandoned or made without amendment. Once we have made a Scheme we must make this available for people to see. We do this by posting the Scheme on our website. Where public notice was given regarding a draft Scheme we may decide that a further period of public notice (in addition to placing the Scheme on our website) is necessary once the Scheme is made. We can correct minor 'clerical' errors (typos, etc) in an authorised Scheme without going through the Scheme making process again. the changes can only be implemented by making a Scheme. We should explain to the trustees that this is the case and signpost to Change a charity governing document by scheme for guidance on the information we require to enable us to consider making a Scheme. We should also ensure that the trustees’ decision making leading up to the formal Scheme application is robust and takes account of all relevant factors. We should signpost the trustees to our guidance: It's your decision: charity trustees and decision making. Trustees of an unincorporated charity may be able to use its power of amendment (rather than applying for a scheme) to make changes to the objects clause, even if the power does not specifically permit changes to objects or purposes. This applies where the changes will not alter the substance or nature of the objects or purposes - for example, where the trustees want to modernise the wording. similarly, the statutory power of amendment (s280 of the Charities Act) could not be used for these types of administrative changes if they concern the description of the charity's purposes. Where we are asked to advise trustees who are proposing to modernise the wording (but not the meaning) of the charity's objects clause, using an existing power of amendment, we should advise the trustees to exercise great caution before doing this, having taken appropriate legal advice on any unintended impact the proposed changes may have. If a charity intends to make this type of administrative change to the objects clause but lacks any power of amendment to do so, our policy is that we will not offer a Scheme to give effect to the changes unless the required criteria have been met (see B4.1). This is on resource grounds. In effect this means that the charity will not have any means of updating the wording of its purposes. We should exercise particular care when asked to make schemes in cases involving the property of schools, literary or scientific institutes, libraries, museums, places of worship or housing for ministers of religion. This is because they may be on land that will revert to the estate of the donor of the land if the trusts are judged to have failed: a scheme that changes a charity’s purposes, beneficiary class or area of benefit may be evidence of failure and could trigger reverter inadvertently. We always need to be clear about the existing trusts before we can agree to change them. Where it's not clear what they are (because, for example, they are not written down) there has to be enough evidence of what they are before we can proceed. A scheme should not be used to confirm or establish clarity about existing trusts - this is for trustees to do. If the proposed changes can only be implemented by making a Scheme, we need to decide what type of Scheme is required in each case so that we use the correct criteria and processes. enabling the disposal of designated land without replacement and/or adding or changing the purpose for which the proceeds of the disposal can be used. There are a number of powers in the Charities Act 2011 under which these Schemes can be made. Most cy-pres Schemes are made under s67 and most administrative Schemes are made under s69. However, other powers in the Act may be used to make these Schemes. There are also other pieces of legislation that give us the power to make Schemes (see E2). When deciding whether a Scheme should be made, the legal tests and other factors that we need to consider will be different depending on what type of Scheme we are making. When considering making a cy-pres Scheme under s67 of the Charities Act 2011, we need to be satisfied that certain criteria have been met (see OG2). Where we are making a cy-pres Scheme under s69 of the Charities Act 2011, the criteria mentioned above do not need to be met. While there is no legal test set out in the Act for these types of Scheme, in practice we will need to be satisfied that the Scheme is expedient in the interests of the charity. Where we are making Schemes under other sections of the Charities Act 2011 or using powers contained in other legislation then there are other legal tests/factors to consider (see E2 for references to separate guidance on these). In all cases when we are considering making a Scheme, we must have regard to the general equality duty in s149 of the Equality Act 2010 and ensure that any decision we make is compatible with the Human Rights Act 1988. Before we make a decision as to whether a Scheme should be made, we will usually expect the trustees to have carried out a genuine and appropriate consultation exercise to take into account the views of the charity's stakeholders about the proposals and properly inform their own decision as to whether a Scheme is required. Our policy is that consultation should be carried out in all but exceptional cases. Although it is not a legal requirement, it is part of our usual Scheme making process and helps to ensure that the trustees have properly established the case for making the changes in the interests of the charity and for showing that the criteria have been met before we commit staff time and resources to proceeding. Only where the changes are so minor, or the particular circumstances of the case are such that consultation is clearly unnecessary, we will consider a Scheme application without any consultation having taken place. the changes are being made only in order to comply with legislation, for example, the Equalities Act. If there is any doubt whether or not consultation is necessary, take legal advice. If the trustees carry out a consultation exercise, this should be designed to seek the views of those who would be affected by, or those who might have a particular interest in, the changes proposed. However the consultation is carried out, it should be clear that this is being carried out on behalf of the charity. For instance, where a Local Authority is trustee of a recreation ground, it would not be sufficient for the Local Authority to present the results of a consultation it carried out in its role of Local Authority rather than as trustee of the charity. If any responses to the trustees’ consultation are sent to us we should forward these to the charity’s trustees. We will only deal directly with representations where these are sent to us following our giving public notice. We require the trustees to give full details of the consultation carried out and any responses to it, including an explanation of how this informed their decision-making and details of any potential opposition to the scheme or controversy about it. Where opposition or controversy is identified, we will expect to see details of any steps taken by the trustees to address this where possible. We will take this information into account when deciding whether a Scheme should be made. This information might also be useful in determining if the Scheme could be contentious meaning that giving public notice of our intention to make a Scheme is necessary (see B10.5). When recording our decision to make, or refuse to make, a cy-pres Scheme under s67 of the Charities Act 2011, we should complete the cy-pres Scheme decision making form. Using this form will ensure that we have considered all of the points relevant to the decision making process and will also provide a formal record of this process and the reasons for making the decision. If we are recording a decision to make, or refuse to make, any other type of Scheme then we should ensure that there is a decision note on the case file setting out all the points relevant to the decision making process and our reasons for making the decision. If we decide that a Scheme should be made, we should formally offer to make it. If the initial approach contains enough information to enable us to do so, we should draft a Scheme at this time and send this to the trustees with the Scheme offer. If we do this, we will ask for any comments the trustees might have about the draft Scheme. If we decide to make a Scheme, but there is insufficient information to draft a Scheme, we should formally offer a Scheme and ask for the necessary additional information at that time. In all but exceptional circumstances, (see E5 - Applying for a Scheme) we can only make a Scheme where the charity's trustees have formally applied for this. We expect trustees to apply for a Scheme by email although we can accept any form of application as long as this is made in writing. An application must be made by a person authorised to act on behalf of the trustees and must confirm that all of the charity's trustees are aware of the decision to apply for a Scheme. If this is not the case, the applicant must provide the name and last known address of any trustee who is not aware of the decision ('non-privy trustees'). Where we are waiting for an application from the charity's trustees, we can begin drafting the Scheme and going through the Scheme making process, pending receipt of the application. However, we cannot authorise a Scheme until we have received the formal application. 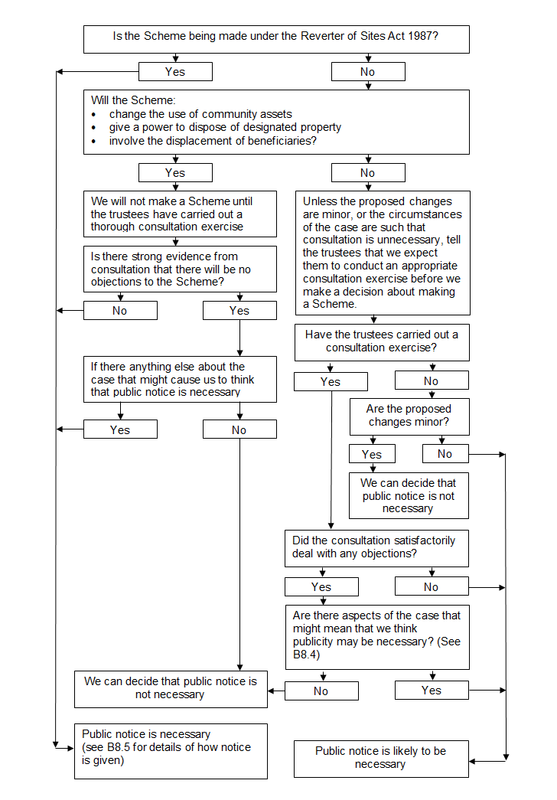 The process for drafting a Scheme is set out in section 4 of Schemes procedures and practice. Broadly, Schemes will, in all but exceptional cases, be made using the Scheme template in Word. This template includes autotext that enables users to insert model clauses, or entire model Schemes, as set out in the Drafting Guide. The Drafting Guide includes full details of the Scheme drafting process including advice on style, language, etc. Caseworkers should take the time to read the introduction to the Drafting Guide to ensure that any Scheme they draft follows the agreed style guide, drafting conventions, etc. Occasionally, trustees, or their professional advisors, might recognise the need for a Scheme and may, in that case, submit their own draft for our consideration. Alternatively, we may be asked to make a Scheme to confirm that a trust deed, prepared by the trustees, is the governing document of the charity. Generally, we will not accept draft deeds and will not make Schemes to authorise these to be adopted unless there are exceptional circumstances. This is because we are responsible for the technical sufficiency of our schemes and orders and we can be most confident about this (and make best use of our resources) where we use our own well-established wording. In addition, it may put the charity to unnecessary expense to pay someone to produce a draft. Where this happens, we will only agree to use the draft where this is a direct copy of one of our model Schemes, or of a recognised model trust deed (for example, <?xml:namespace prefix = "st1" ns = "urn:schemas-microsoft-com:office:smarttags" />ACRE’s model trust deed for village halls). This applies in all cases, unless exceptional circumstances mean that there are identifiable and cost-effective reasons to accept a draft that is not a direct copy of a model. where the charity works with children or vulnerable adults, to ensure that we do not appoint people who are disqualified from acting, or who are unsuitable to act, as trustee of this type of charity. Where we make a Scheme that includes the names of serving trustees, these trustees are not appointed by our Scheme so we do not have to carry out trustee checks. However, we expect that the trustees will have carried out DBS checks, if required, on each trustee at the time of their appointment. The process for carrying out trustee checks when appointing a trustee in a Scheme can be found in section 6 of Scheme procedures and practice. Full details about the law and our policy regarding Disclosure and Barring Service checks are available in OG510-2. A 'non-privy' trustee is a trustee who played no part in the decision to apply for a Scheme and is not aware that the other trustees have made a decision to apply for a Scheme. We will encourage trustees to ensure that all the trustees are aware of the decision to apply for a Scheme themselves. However, where there are non-privy trustees we must write to them, at their last known address (provided by the other trustees), informing them of our intention to make a Scheme. We do not have to invite the non-privy trustees to comment. we must treat all of the last known trustees as non-privy trustees. Although the Act does not specify the length of the non-privy trustee notice period, our policy is that we allow one month from the date of the notice before we make the Scheme, in case the non-privy trustee would like to comment on the proposed Scheme. officer agent or employee of a charity. This might be an ex-officio trustee where the ex-officio post is removed by the Scheme or a holding trustee who is replaced by a vesting clause in the Scheme. We cannot assume that the person has consented to the removal of the post just because they are party or privy to the application to make the Scheme. We should always ask the person concerned to specifically consent to the removal. If no consent is available, we must send official notification. In this case, s89(5) of the Act requires that we inform the person that our Scheme will remove them and invite representations to be made. The Act also specifies that the notice period must be at least one month. This requirement to give notice does not apply if the person cannot be found or has no known address in the UK. Under section 213 of the Housing and Regeneration Act 2008 we have a legal duty to consult with the Homes and Communities Agency (or, in Wales, the Welsh Government) if we are proposing to amend the objects of a Registered Social Housing Providers (RSHP). This includes Almshouse charities that are RSHPs. We should allow at least one month to consult the Homes and Communities Agency or Welsh Government. Where a charity is a member of an umbrella body we may have a memorandum of understanding (MoU) with the umbrella body. If this is the case we must adhere to the terms of that memorandum. For example, we have a MoU with the National Association of Almshouses ('the Almshouse Association'), which requires that we send a copy of a draft Scheme to the Almshouse Association if that Scheme alters the objects of an almshouse or authorises the sale of an almshouse (even if the almshouse is to be replaced). We will do this in all cases unless it is apparent that the almshouse charity is not a member of the Almshouse Association. We are required by law to give public notice where we are making a Scheme under the Reverter of sites Act 1987 (see OG27) in this case we cannot decide that public notice is not necessary. In all other cases, we must give public notice, unless we decide that, for reason of the nature of the Scheme, or for any other reason, public notice is not necessary. we will, in all but exceptional circumstances, require public notice. We do this primarily because cases of this kind can often be contentious. ‘Exceptional circumstances’ in this context might be where, following a thorough consultation exercise, there is strong evidence that there will be no opposition to the Scheme. Where the case does not fall into one of the categories above, we need to decide, on a case by case basis if public notice is not necessary. To help us decide this, if it is not already apparent from the details of the consultation (see 4.2), we should ask the trustees, at the time we offer to make the Scheme, if they think that it is likely to be contentious or if they know of any opposition to it. we are aware of opposition to the proposed Scheme which has not been addressed by the trustees' consultation. If we do decide to give public notice, the process is set out in section 7 of Scheme procedures and practice. This section also explains when it might be necessary to inform a parish (or, in Wales, a community council) of our intention to make a Scheme (see also B10.7) and carries suggested email text to use when informing the trustees of our decision. Whatever our decision regarding public notice, we should record the reasons behind this decision on the cy-pres Scheme decision form where we are making a cy-pres Scheme under s67 of the Charities Act 2011 or in a decision note on the case file where we are making any other type of Scheme (see B4.3). Section 88(8) of the Act gives the Commission discretion to decide the contents of the notice and the manner in which publicity is given. When deciding how notice should be given we should consider the type of charity and take into account its area of benefit. However else publicity is given, if we decide that public notice is necessary, we will always post a copy of the draft Scheme on our website. Whatever the form of notice, the trustees must keep accurate records of this in case any queries arise. The trustees must also make sure that copies of the draft Scheme, and any other documents relevant to the public notice process, are available to the public even after the notice period has ended. Usually, for a local charity, we would ask that a notice is posted on or near to the charity's property and/or published online as appropriate (either on the charity's website or on a relevant community website). When deciding how best to give notice, caseworkers might find it helpful to discuss this with the charity's correspondent. As well as deciding whether to give public notice of our intention to make a Scheme for a local charity, the Act says that (where the charity is not an ecclesiastical charity) we must communicate a draft of the Scheme to the parish or (in Wales) community council (or, where there is no such council, to the chair of the parish meeting). We must do this in all qualifying cases unless we decide that this is unnecessary. If we decide to do so, contact details for the relevant council should be available online or could be provided by the correspondent. Whether or not we decide to give notice to the council, we must clearly record our decision, and the reasons for making this, on the case file. Model text for an email to a council is available in section 7 of Scheme procedures and practice. Where a charity operates nationally we again have discretion to decide how publicity is given. We should not always insist that a notice is placed in a national newspaper (this can be expensive). Instead we should consider whether adequate notice can be given by other methods such as notices in supporter newsletters or on the charity's website or websites of any relevant third party (umbrella bodies, etc). We must also be sure that we treat a charity as a national charity only where this operates nationally. There may be instances where a charity has an unrestricted area of benefit in its governing document but it operates in a clearly defined local area. In this case we will treat the charity as a local charity. If we decide that public notice is required, we must also decide how long the notice period should be. Our usual notice period is one calendar month from the day the notice is first displayed. We may, in exceptional circumstances, decide to reduce or extend the notice period. We might decide to extend the notice period where the date covers a holiday period or religious festival or where the notices go up in a park or open space in the winter where there are potentially fewer visitors. If we do decide that a longer notice period is necessary, we might extend this to six weeks. It is extremely unlikely that a notice period of more than six weeks would be appropriate. Conversely, in order to reduce the time taken in making a Scheme we might decide that a shorter notice period is acceptable. Whatever the notice period we decide is appropriate, the notice itself should clearly set out the date that notice will end. Model wording for the public notice and for the covering email text can be found in section 7 of Scheme procedures and practice. only require the Scheme to be made available locally if we had published the draft Scheme and received representations. Section 88 of the Act states that we must take into account any representations made to us in relation to a draft Scheme and, having done this, we may proceed to make the Scheme with or without modification (without giving further notice). It follows that, having considered representations, we may decide not to make the Scheme at all. prepare a background note giving details of the case. LRT will then manage the representation consideration process. If we decide to make the Scheme, with or without modifications, the reviewer will refer this back to the original caseworker to process the making of the Scheme. Once the Scheme is made, this will be referred back to LRT to issue and to respond to the people who made representations. The person appointed to review the representations must be careful to form an objective view of the case in support of the Scheme as well as the representations against it. When considering representations we must ensure that the representation is relevant to the proposed Scheme and received within the time limit set out in the notice. (Although we can decide to take into account representations received after the deadline, and before we make the Scheme, if the information contained might affect the making of the Scheme). A representation does not need to be based on a point of law nor need it be supported by evidence or argument. the technical sufficiency of the Scheme. When considering representations we should not feel any loyalty to what we have already agreed with the trustees, we should review the draft Scheme with an open mind. if the representations suggest that making the Scheme is no longer justifiable, we should discuss the representations with the trustees. if the representations suggest modifications to the Scheme that we have already considered, but the case put supporting the modification is new, we should consider the proposed modifications again, in the light of the new case made. Having done this, we might decide to discuss the modifications with the trustees. if the representations suggest modifications that we have not considered, and if we feel that the proposed modifications might be worthwhile, we should discuss these with the trustees. Before making a decision based on the representations the reviewer might think it necessary to refer the case back to the caseworking team for further work before a decision can be made. Once we have considered the representations, and discussed any proposed modifications with the trustees, we must decide how to proceed. reject the representations and make the Scheme as drafted. In this case the reviewer must prepare a decision document setting out the reasons for rejecting the representations. This will be issued by LRT. accept the suggestions put forward as representations and amend the Scheme accordingly. In this case the reviewer must decide if a further period of public notice is needed. This would normally only be the case where the changes are substantial. If there is any doubt about whether or not additional public notice is required, the reviewer should consult a Commission lawyer. terminate the Scheme making process. In this case the reviewer must set out the reasons for making this decision and refer the case back to the originating caseworking division to take the case forward or close the case as necessary. There may be occasions where we discover, after we have made a Scheme, that this contains a minor or 'clerical' error. By 'clerical error' we mean an error that does not materially affect the working of the Scheme, it might be a spelling mistake or another typing error. Where we come across a clerical error we can correct this without having to republish the Scheme. We simply need to create a new version of the Authorised Scheme, make the amendments, add a note under the Authorised Officer's name to say 'Amended on...' and file this. Having done this we must send a copy of the amended Scheme to the charity's correspondent and ask that they destroy any copies of the previous version of the Scheme. We may come across a case where we have made a Scheme in error, either because we have been deliberately misled into making the Scheme or because we have made the Scheme by mistake. In this case we will usually discharge the Scheme and take whatever additional action is necessary. Where we have made a Scheme as a result of misinformation given to us we can discharge this Scheme by making an Order within 12 months of the date of the original Scheme. If more than 12 months have passed, the Scheme can only be discharged by making a second Scheme. In either case, if we want to save any acts carried out under the authority of the original Scheme, we must specify this in the Order (or Scheme) discharging the original Scheme. The person who provided the misinformation could be subject to action under s60 of the Act. Similarly, where we have made a Scheme by mistake, and the mistake was ours, we can discharge the Scheme by making an Order (unless more than 12 months have passed, in which case a second Scheme is required.) In this case, the trustees who relied on the authority given by the Scheme are likely to be protected from any potential breach of trust which might be seen to arise as a result of the Scheme being discharged. Where appropriate, we can make 'savings or other transitional provisions' in the Order under s337(4). We should also consider whether trustees may challenge any action by reference to any rights they may have under Article 1 of the First Protocol of the Human Rights Act 1988. Income - Less than £1,000pa. Objects - The provision of a village school. Assets - The charity owned a former school building. Activities - The school had been closed for some time and was let as a residential property. The trustees retained the income as a repair fund for the property. The trustees approached us to authorise the sale of the property and asked if the sale proceeds could be used to help to fund the building of a new village hall. The new hall would be available for educational and youth club activities amongst other things. We replied, explaining that, while we could give the trustees a power to sell the property, the sale proceeds could only be used for educational purposes and could not part fund a new village hall. We offered to make a Scheme including a power of sale and giving the charity our standard advancement of education objects. We asked if the trustees thought that the sale might be contentious to the extent that public notice might be necessary, we set out the criteria we use when deciding whether to give public notice. We also asked if the trustees had carried out any consultation in the area about their intention to sell the school building. The trustees said that they had informally consulted with the villagers and, while the trustees had tried to re-assure people that the sale would benefit the charity, it was possible that the sale could be controversial. This was partly due to the level of local interest in the sale and partly because the tenant would be displaced by the sale. The trustees submitted a written request for a Scheme (by email) and confirmed that there were no non-privy trustees. We provided the trustees with model wording to be used in the publicity notices. Objects - The provision of housing for people in need who are members of the Church of England, with a preference for female relatives of the clergy. Assets - The charity owned a small block of almshouses. Activities - The almshouses were in poor condition, consequently, there were no residents in place. The trustees approached us to amend the objects so that, once the properties were renovated, there would be no difficulty in finding qualifying beneficiaries (there had been difficulties in the past which was partly why the almshouses fell into disrepair and disuse). The trustees had been promised sufficient grant funding to modernise the properties. The trustees provided some draft objects; if adopted, these would remove the religious qualification and extend the beneficial class from poor people, who are inhabitants of the city, to poor people with a connection to the county. We replied, stating that we could not authorise the amendment to the objects as drafted because the removal of the religious qualification and extension of the area of benefit went too far beyond the terms of the original trusts. We suggested some objects which would retain a preference for members of the Church of England and included provision to house people from outside to the area of benefit, in exceptional circumstances. We asked if the trustees thought that adopting these new objects might be contentious and set out the criteria we use when deciding whether to give public notice. We asked if the trustees thought that, in the context of these criteria, public notice might be necessary. We also asked if the trustees had carried out any consultation with residents of the area of benefit regarding their plans. The trustees said that they did not think there would be any particular opposition to the change of objects. A local newspaper had carried a story about the proposals, this invited readers to send comments to the trustees. The comments received made it clear that local residents would be very happy to see the almshouses renovated and functioning, and would not object if that meant a change in the beneficiary class was necessary. Because of this, they had not carried out any more formal consultation on the plans nor did they think that public notice would be necessary. We decided, considering the case on its merits, that it would not be necessary to give public notice of the proposed Scheme. While the Scheme would materially affect the objects of the charity, the changes were relatively minor and in keeping with the spirit of the original trusts. We were also convinced, by the information provided, that it was very unlikely that there would be any opposition to the making of the Scheme. The power to make a Scheme for a charity is given to the Commission under various sections of the Charities Act as well as other legislation dealing with particular types of charity. A Scheme can change all or any part of a charity's governing document. It cannot settle a dispute over property ownership or determine the existence or extent of a trust. In all but exceptional circumstances, we can only make a Scheme once we have received a written application. Before we make a Scheme we must give public notice of our intention to do so, unless we decide, for any reason, that this is unnecessary. We must inform any trustee who was not privy to the application, and anyone who will be removed from office by the Scheme without their consent, of our intention to make a Scheme. Section 73 gives us the power to settle, but not make, a Scheme for a charity governed by Act of Parliament. This kind of Scheme can only be made by Order of the Secretary of State. If we are approached by a charity with a request to make a Scheme under one of these four Acts, caseworkers should take legal advice. involves a particular point of law or fact. Where there is a possibility that a referral to the Court might be appropriate caseworkers should take legal advice. An application must be made in writing. We expect an application to be made by email by someone authorised to act on behalf of the charity's trustees. if it is a local charity, any two or more inhabitants of the area of the charity. we can appoint one or more trustees 'of our own motion' so that they can apply for a Scheme. This appointment can be made by Order under s80(2) (see OG510-1). Alternatively, in some circumstances, trustees can be appointed by certain related parties without the need to make an Order. The power to do this is provided by section 36 of the Trustee Act 1925. Further information about using s80(2) powers and s36 of the Trustee Act 1925 is available in OG510-1 Charity Trustees: Making and ending appointments. we have given the trustees an opportunity to make representations to us. where there is more than one group of individuals claiming to be the trustee body and there is a disagreement about who can apply for the Scheme. The power to do this is given by s70(5) of the Act. make a copy of the draft Scheme available to the parish or community council, if the Scheme relates to a local charity in a parish or, in Wales, a community (except if the charity is an ecclesiastical charity). are party or privy to the application ('party' means the trustee was involved in making the decision to apply for the Scheme, 'privy' means the trustee has been made aware of the decision to apply for the Scheme). has no known address in the UK. This requirement does not apply where the Scheme will abolish the office of trustee (even though this will have the practical effect of removing the trustee) nor where someone stops being a trustee because the Scheme transfers the title to charity land to the Official Custodian. A Scheme is a legal document made by the Commission. A Scheme can amend, replace or extend the trusts of a charity. It can set out new objects and purposes for a charity or amend or remove a prohibition or restriction. a s105 Order of the Commission. The individual trustees (or corporate trustee) of a charity can apply for a Scheme, once they have considered alternative ways of making the changes they require. We will only make a Scheme after receiving a formal application from the charity's trustees, apart from in the exceptional circumstances set out in E5 - Applying for a Scheme. We expect trustees to apply for a Scheme by email. The application must confirm that the trustees agreed to apply for a Scheme at a properly convened, quorate meeting. The trustees should make sure that all of the trustees, whether or not they were at the meeting, are aware of the decision. If they cannot do this, the application must include the name and last known address of any trustee who was not party or privy to the decision to apply for the Scheme. ('Party' means the trustee was involved in making the decision to apply for the Scheme, 'privy' means the trustee has been made aware of the decision to apply for the Scheme.) We cannot make a Scheme without all of the trustees being aware of the application. Where a trustee cannot be contacted by the other trustees we are required to send a formal notice of our intention to make a Scheme to their last known address. This notification does not need to ask the non-privy trustee to comment. We can, in certain circumstances, make a Scheme without an application from the trustees (see E5 - Applying for a Scheme). We are required, by the Act, to give public notice of our intention to make a Scheme for a charity unless we decide that, for any reason, public notice is not necessary. We will usually only give public notice where the Scheme is likely to be contentious. We can make a Scheme for a charity governed by Royal Charter. Any part of the Scheme that requires that the Charter is amended will only take effect once that amendment takes place. We can also settle, but not make, a Scheme for a charity governed by Act of Parliament. We will do this where we think it is necessary or desirable to alter the Act or to make some other provision beyond our normal powers or where we think it is proper for the Scheme to be subject to Parliamentary review. Caseworkers should take legal advice if we are asked to make a Scheme for a charity governed by Royal Charter or Act of Parliament. Where our Scheme appoints trustees, we must carry out the appropriate trustee checks before we make the Scheme. This is to ensure that the trustees are not disqualified from being trustee (under s178 of the Charities Act). And, where the charity works with children or vulnerable adults, to ensure that the trustees are not disqualified from acting, or unsuitable to act, with this kind of charity, by carrying out CRB checks. This only applies where our Scheme appoints trustees. Where the Scheme simply names existing trustees, the responsibility to carry out the appropriate checks lies with the trustees. Where a governing document is missing, before we exercise our powers we must know what efforts have been made to find the deed and what inquiries have been made to establish the trusts. we must be able to satisfy ourselves from the above (and any other relevant information at our disposal) that the property is subject to a charitable trust (since we cannot exercise our jurisdiction where no charitable trusts exists). If an administrative Scheme is to be made, we must be satisfied that it is both necessary and expedient for the administration of the charity. In part this may depend upon whether the trusts, as understood, can continue to be administered and the effect of any uncertainty on administration. If a cy-pres scheme is to be made, we must be certain that a cy-pres occasion has arisen (s.62) and that the proposed application of property would be appropriate (s.67).